Jack Budnick is President and CEO of AbsolutAire, Inc. Jack is responsible for overseeing all company functions and is Chairman of the company’s Board of Directors. 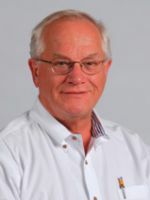 Jack began his HVAC career in 1972 as an Accountant with Rapid Engineering, Inc., in Grand Rapids, Michigan. He became President and COO of the company. Jack left Rapid in 1991 to form AbsolutAire with Robert Jauch Sr. and other investors. Jack holds Bachelor of Science Degrees in Accounting and Marketing from Aquinas College. He has also earned Master’s Degree credits from Western Michigan University in Kalamazoo. Over the years, Jack has participated in various professional development activities, including specialized training in business management, benefits administration, and direct-fired industry standards. Jack has served on various committees for both ASHRAE and GAMA, and has been an ASHRAE member since 1999.